Maybe you know the Chia seeds already, maybe you’ve never heard of them.. I’ve known them for quite some time now, but I must confess I didn’t use them very often. I was always wondering what to do with them besides sprinkling a spoonfull on top of a smoothie or my oatmeal. But know I’ve found another way to use those (healthy) little buggers: Chia-pudding! Do the preps the night before, because this breakfast dish goes in the fridge overnight. Perfect if you don’t want to spend much time fixing your breakfast in the morning! Superfood? Some people refer to chia seeds as superfood (mostly the people very eager to sell I think..). Personally I think the term ‘Superfood’ is somewhat misused and/or misunderstood. To me Superfoods do not have ‘magical’ super powers, as some sellers want to make you believe. But I do think that some products are very good for you because they are high in certain vitamins, minerals, proteins or any other beneficial nutritional value. Well, that sounds awesome of course, but let’s keep it real! Personally I think it’s best to have a varied diet based on natural products, of course you can incorporate some of the so-called superfoods into that! What’s your opinion about ‘superfoods’? Which ones do you use? Share your thoughts in the comments below! Chia seeds are loaded with omega-3 fats, which have different benefits for our health such as preventing heart disease, artritis and depression and other psychological conditions. It’s very important to consume enough foods that provide omega-3. Research tells us that most people don’t consume enough omega-3, compared to the consumption of omega-6. For the Dutchies: klik hier voor een beknopte uitleg over omega 3, 6 en 9! Chia seeds are also high in protein, iron and fibers and therefore give you a saturated feeling after consuming them. Chia is high in calcium as well, which is an important mineral for the strenght of our bones and teeth. At last, Chia is high in Borium, this mineral enhances the absorption of calcium and seems to help prevent osteoporosis for example. topping of your own preference: I used fresh strawberries and a tbsp of shredded coconut. Put the banana, almondmilk, vanilla essence, honey and cinnamon in a mixing cup and blend by using a handmixer (or blender). Add the chia seeds after mixing and stir well so the chia seeds get well mixed through the banana-almondmilk mixture. Put in the fridge overnight. 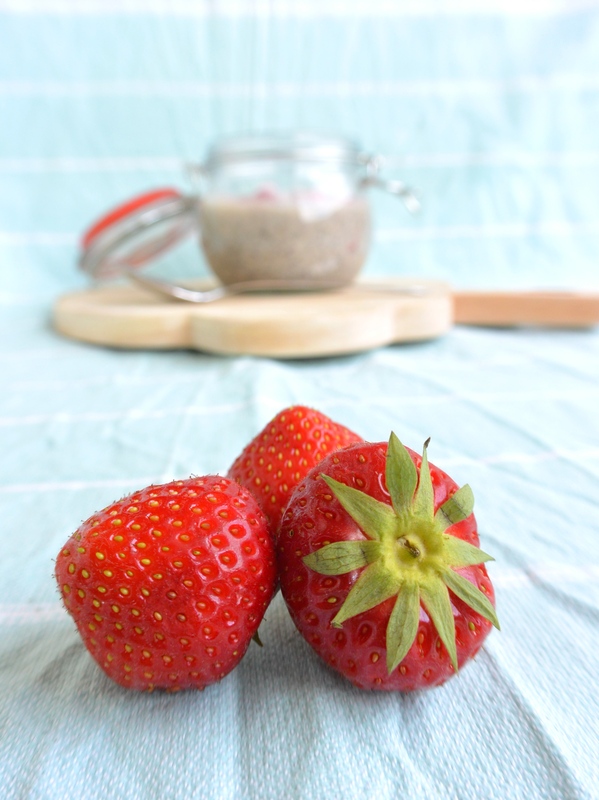 Get the chia pudding out of the fridge the next morning and give a little stir again. Serve in a glass of bowl and top it with the toppings of your own preference! I used fresh strawberries and shredded coconut. Posted in Breakfast, recipesTagged breakfast, chia, chia seeds, dairyfree, fit, food, fruit, glutenfree, glutenvrij, healthy, healthy breakfast, healthy lifestyle, natural, ontbijt, recipe, seeds, soyfree, sugarfree, suikervrij, zuivelvrijBookmark the permalink.